While most animals are caching food and preparing to hibernate, brook trout are getting amorous in chilly Minnesota streams. Found only in cold, clear, spring-fed streams, brook trout get hot when temperatures get cold. In water temperatures of 40 to 49° F, mature males and females pair up and select a comfy gravel bed with good water flow. The female swishes her body and tail over the gravel to scrape out a 4 to 12 inch-deep saucer, called a redd, which the male defends until the female is ready to lay eggs. When she is ready, she moves into the nest and the male follows her. As she drops her eggs, the male simultaneously fertilizes them. The female then covers the eggs with gravel. The eggs will hatch in 50 to 150 days, depending on the water temperature. Impacts from agricultural and urban development have degraded streams and surface waters, with a resulting loss in trout populations statewide. Remarkably, however, we are fortunate to still have numerous healthy trout streams right in the Twin Cites area. Self-reproducing populations of brook trout can still be found in several tributaries to the St. Croix River in Washington County  Falls Creek, Gilbertson Creek, Willow Creek, Pine Creek, and Old Mill Creek. In Dakota County, brook trout can be found in Pine Creek and Trout Brook, tributaries to the Cannon River, while a healthy population of brown trout lives in the Vermillion River. 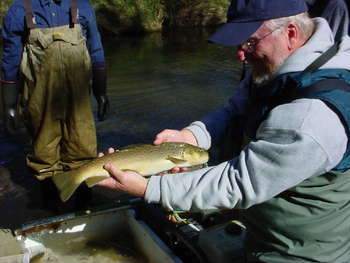 Brown trout is an introduced species that is somewhat more tolerant of increased temperature and some pollutants than brook trout, though a healthy polulation of brown trout is still an indicator of very good water quality. Brown trout also tend to out-compete brook trout, so they have replaced brook trout in some streams. Brown trout have a similar life cycle to brook trout, though they are longer-lived and larger in size. Regulations to protect trout streams from further degradation include bans on stream disturbances (such as bridge work) during spawning season and other regulations governing water appropriation, storm water runoff, and stream buffers.